Solo offshore. – Dirty wet dog , boats and sailing. A few people here and some work colleagues have variously commented about the post ‘what’s it like’ and that has generated even more questions about other aspects of boats and seamanship that many wouldn’t think of : for example even the practicalites of living, eating, sleeping (or not) and yes even down to the basics of heads or bucket. At some time as i go along i am going to do blogs about single subjects that relate to this ,right now for example i have one that i am working on just called ‘soogee’ which is all about my method of washing at sea and on the trail with just a litre of water and a few drops of detergent . The post i have mentionned above is just about the one narrow area of sailing seamanship that first inspired me to go sailing ie fully crewed and long distance ocean racing : to be honest it was a long journey just to get there and for most of my sailing racing career i was just a so-so crewmember of club level racing boats thrashing around the Irish sea and chundering rather a lot. By 1989 though I had all but given up sailing when a series of events catapulted me into my Whitbread ride and the professional career that i had for a few years after that and even then i didn’t get there as a sailor but as the boat’s medic. Talking about that side is yet another aspect of the big boat life ie working on and running private or charter yachts which is really what the industry is about and that’s more like running a small hotel for demanding guests and often unfortunately ones that you can’t escape. I wasn’t very good at that side of professional sailing, i saw it basically as a service industry on water and found it more personally satisfying to work in a genuine service industry ie healthcare where at least i got to go home at night/day. My other great ambition was to become a solo long distance sailorand in those days my ambition was to get a basic boat together for a race called the OSTAR or single-handed transatlantic race in the days when it could be sailed in a small boat. Nowadays that race has gone out of most amateur sailors reach and there are instead other similar events for small boat sailors : one such event is the newer ‘Jester’ challenge which has a maximum size limit at 30 feet, another small boat event is the mini-transat started by the late Bob Salmon who i crewed for at one time. 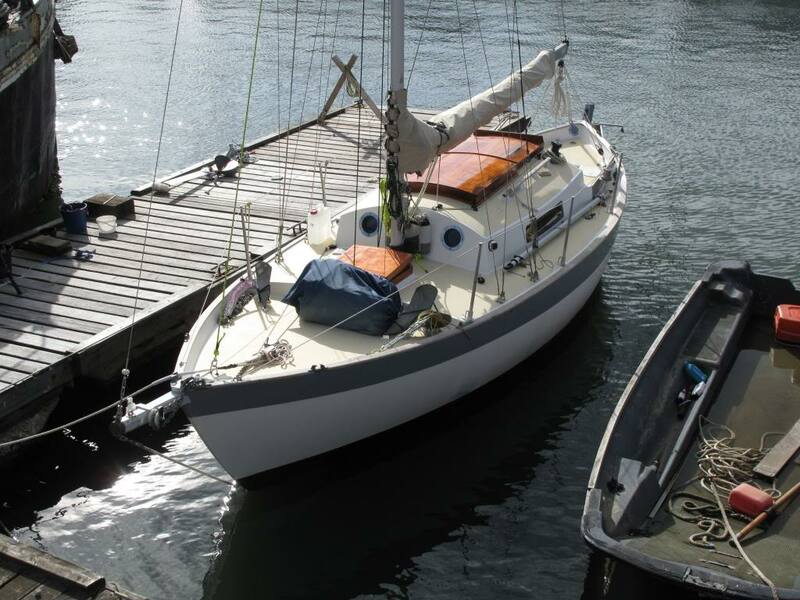 I started to put a project together to sail in the Jester challenge bit gave up on the boat early in the preparation stage and instead focussed my efforts on fitting out a small offshore/ocean cruising boat : my Frances 26 which i mention a lot. As some will know i set that boat up to retire with when i left the NHS and with the intention of having a period of ofshore ocean cruising which might have included a passage through the Panama canal and down to NZ : it didn’t happen purely because i sold the boat to use the funds in our cottage project. The Frances embodied just about everything i knew about small self-reliant and simple ocean going sailing boats and not only that but was also set up as a maximally comfortable and liveable small space. I didn’t ever get to NZ with the Frances as once again other things happened, i did manage a much shorter retirement cruise during which i sailed her solo down to southern Brittanny and back before throwing myself into the full time work of a cottage and gardens refit….the garden work alone was around 2,000 actual hours before i stopped counting ! so sailing went by the board completely until last year when i bought the liberty. I was completely happy to go offshore on my own in the Frances and would i think been happy with her on a solo ocean voyage. As it is my longest solo passage was only around 40 hours actual sailing time and maybe 50 hours between sleeps : ok i have to admit that i was a little fuzzy in the head at the end of 50 hours straight awake but that was mainly because i had the difficult navigation and pilotage right at the end when i was at my most tired. So i don’t have vast experience as a single-hander, really just the passages across the channel in 2 boats : the Frances and the liberty and then some coastal cruising with those boats and a couple of others although it has to be said that a long slow passage cross channel is one of the problem passages due to the shipping channels, very strong spring tides that i had both times and having to land on not the easiest of coasts in the dark and when very tired. My experience with ocean sailing is that generally its a lot easier than that and a lot of ocean miles are surprisingly routine and typified by not enough to do rather than being task-loaded in a cross channel bash. By that period in my own sailing though i had stopped being driven by ideas from the racing world and was leaning towards a greater simplicity so some of the main features of the boat were things like wind vane self steering and very well made custom sails but that are hanked on rather than on roller-furlers . There is so much less to go wrong and in budget terms i could have either one headsail and its roller reefing gear or 3 headsails, i chose 3 hanked on headsails !. Crucially i had wind vane self-steering so offshore i never steered the boat but instead spent my time on watch, sail trimming,navigating and just looking after the boat and myself. I always felt that the boat also looked after me, she never felt like a fast boat either but she did just keep eating the miles and that’s what a long distance sailor needs in a boat ie easy to sail and just keeps chewing up the miles. After that i concentrated on really essential kit such as proper anchors and ground tackle :and discovered a simple truth with cruising boats ie that they should either be sailing and steering themselves or solidly at anchor on their own gear and not i note festering in a marina costing money just to lay alongside. Inside she was an open plan with 2 bunks aft which meant that when we were both on board we each had our own space then a working area under the doghouse of a galley one side and chart table opposite and then a large longing/sleeping area forward of that and then a mini-forepeak forrad of that. I lived aboard her as much as i could throughout the year and she was really comfortable to spend time aboard. Compared with my current boat the Frances has vastly more space so it was far easier to do simple things like the cooking and a huge chart table to work on and lay the charts out on. I probably wouldn’t buy a boat like that again even if i could afford it : the Frances being a boat that i really just liked the look of and somehow always wanted. Nowadays i would look for something a lot more basic for the budget and put the time and money building it back up to my spec and often that would mean a much larger rig on most modern crusing boats…..most in my opinion being very under canvassed especially downwind. The skillset and mindsetof single-handed offshore and ocean sailing is where i think solo sailing starts to get very interesting, i believed then as i do now that i have the ‘right stuff’ to be a solo offshore and ocean sailor and in hindsight think that i did pretty ok with it. Skills wise i learnt more with that boat than any other boat i have been involved with because i knew i had to be able to do most of the work myself. During my time with the Frances i re-rigged, re-engined and re-did all the boat electrics just by learning how to do it rather than buying somebody elses skills and time. Of course i made mistakes and had to redo work but that’s just the process of learning : now when i was faced with yet another boat with dodgy electrics i knew that i could knuckle down and re-wire it completely. The mindset is i believe is a lot about self-reliance and a reduction to simple rugged systems that if not unbreakable are easily fixable, the skillset is a multiple one as the long distance sailor needs more than average ability in each area of seamanship…has to for example be a capable sailor and navigator etc and also have a good insight to all the technical skills needed : i was a good rigger when i started on this project but knew very little about engines and electrics for example.The refit that i did encompassed not only getting an old engine out and a new one in : and that included building new engine bearers but an almost complete internal refit and all new electrics. Mind you i was blown away by the lady owner of a 32 foot steel boat that we met in Brittanny as she had not only lofted and welded her boat from scratch but then completely fitted it out and made her own sails too and now lives aboard an cruises permanently. Today the solo long distance ocean racing scene as opposed to just crusing has become very specialised and mostly with boats that are very difficult to sail, i don’t intend to add that material now as its all other peoples work and i wanted just to bring this post back to my own efforts. In the context of small and simple cruising boats one of my old mates managed to sail to the caribbean and back in a boat that cost around £1000 total !, the Frances was a lot more than that and today i would look for a much better value boat to do the same job but then equally i have moved on with boats again . This post is in a way just a starter post to introduce the subject and then i can build from here to talk about going to sea solo : the problems and pitfalls , making it work and talking about the skills and mindset that make the long distance independent sailor. Below are the 2 picture here that aren’t mine and i don’t even know who to credit it to, its a sistership La Luz and Don (her owner) was just leaving into the Pacific for a cruise. Below and just as a final picture for now is one of the highlights of my short solo cruise in southern Brittanny and is from the Fleuve Odet , essentially the river Odet inland of Benodet and waking up at anchor on a quiet and still morning on the river.